So, you've tried many combinations in an attempt to configure your Mac OS X L2TP/IPsec VPN clients to use IKE authentication with certificates with your ISA Server 2006, certificates issued for the Mac VPN Clients and ISA by an internal Windows Enterprise CA. You may have a couple of certificates installed on ISA issued by this CA, so you have troubles identifying which certificate is ISA picking for IKE authentication, if this certificate has the "correct" fields required by the Mac OS X L2TP/IPsec VPN clients' security checks. Till now this "game" left you fuming. 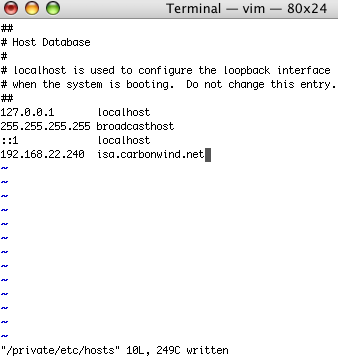 I've mentioned in the first part of this article about the posibility of using a separate CA to issue certificates just for the Mac OS X L2TP/IPsec VPN clients and ISA, certificates that can be used for IKE authentication. 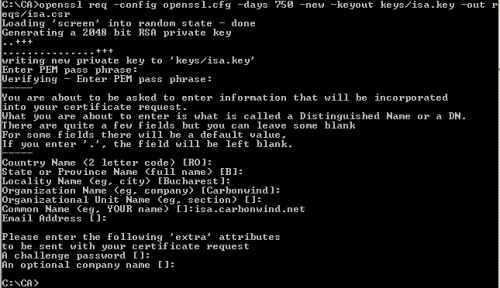 If you have not gave up, and you are still searching for a solution, one such solution can be to use an OpenSSL CA to issue the needed certificates for IKE authentication. 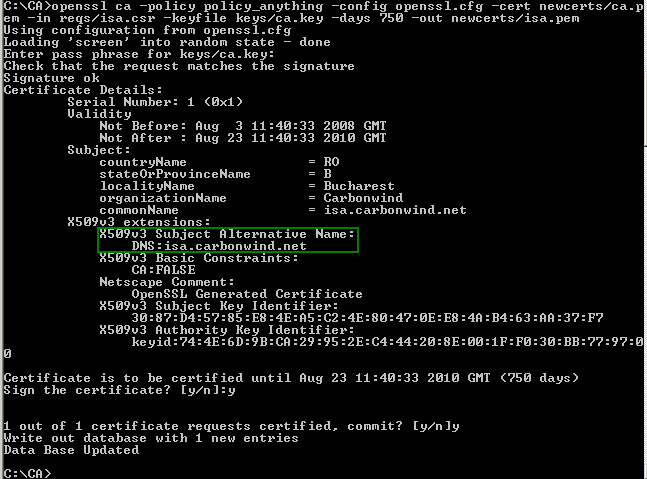 Your Windows L2TP/IPsec VPN clients will continue to use the same certificates they used before for IKE authentication. 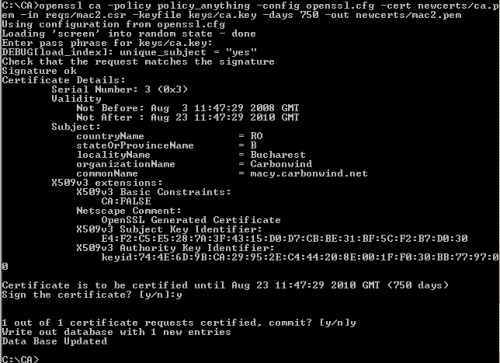 We will use this OpenSSL CA just to issue to ISA a "valid"(from the perspective of the Mac OS X L2TP/IPsec VPN clients) certificate and also to issue certificates for the Mac OS X L2TP/IPsec VPN clients. I'm using an OpenSSL CA because it can easily issue the "correct" certificate for ISA that will work with Mac OS X L2TP/IPsec VPN clients. We have seen that it is recommended to have installed on ISA a certificate with no EKU field and with the SAN field containing a DNS Name, a FQDN which the Mac OS X L2TP/IPsec VPN clients will use as their VPN server address. 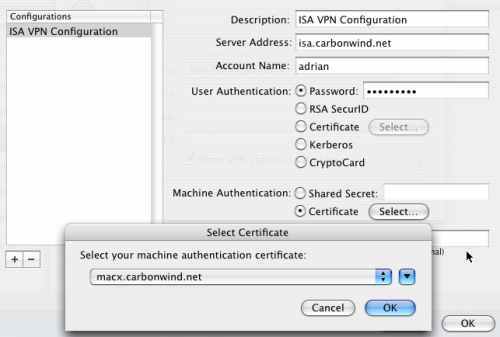 Since only one certificate will be installed on ISA issued by this CA, you will know for sure what certificate will be used for the IKE authentications between ISA and the Mac OS X L2TP/IPsec VPN clients. No more "games". I will use a Windows XP SP3 x32 machine on which I will install OpenSSL. Make sure the machine you will use is a "clean" and safe machine. It would not be a good idea to use a machine which was infected with a virus or so. I've downloaded, copied and installed on my machine the latest OpenSSL version for Windows from here, as writing Win32 OpenSSL v0.9.8h. I've created a working folder on my C:\ drive. I've call it CA. You can download this folder from here as a zip archive if you want, so you can start right away issuing certificates. 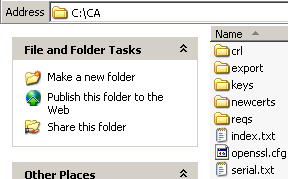 - the crl folder, an empty folder which will be used to store the CRLs. 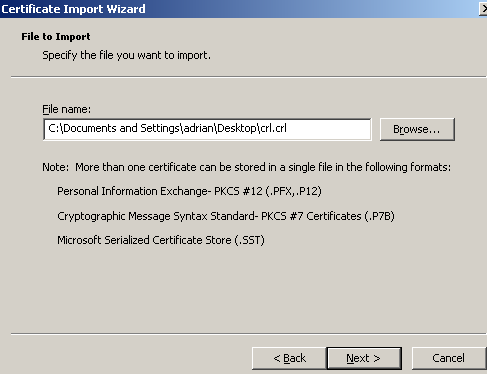 - the export folder, and empty folder which will be used to hold the converted certificates from PEM to PKCS #12 format. - the index.txt file, an empty text file, the database index file. - the openssl.cfg file, this is a modified version of the standard OpenSSL config file found in the default installation folder, C:\OpenSSL\bin. 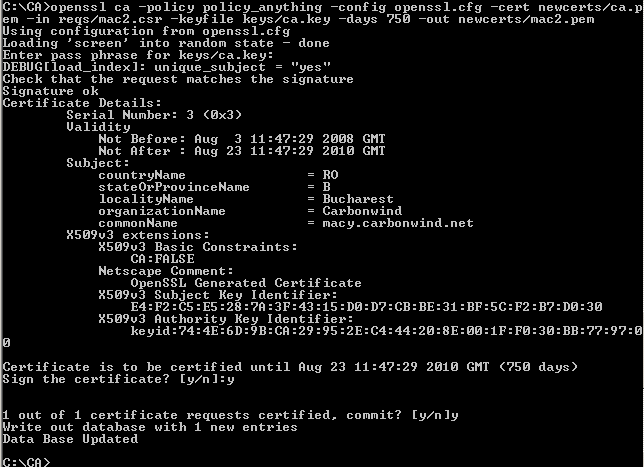 I've quickly modified the standard version so that I can create a CA certificate and start signing certificates with this CA's private key. You can further enhance this openssl.cfg to fit your needs. - the serial.txt file(holding the current serial number), a text file containing 01 and a new line(create an empty text file, enter 01, hit enter and then save the changes). For example, using the openssl.cfg file you will issue RSA 2048-bit private keys for your clients, the default hash algorithm for signing the clients' certificates is SHA-1. 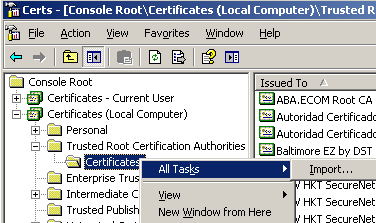 The client's certificates will contain the extension basicConstraints = CA:FALSE (thus the users will not be able to create subordinate certificates). The clients certificates will not have the EKU or the SAN fields. We will make a modification to this openssl.cfg file in order to issue to ISA a certificate with the needed SAN entry. 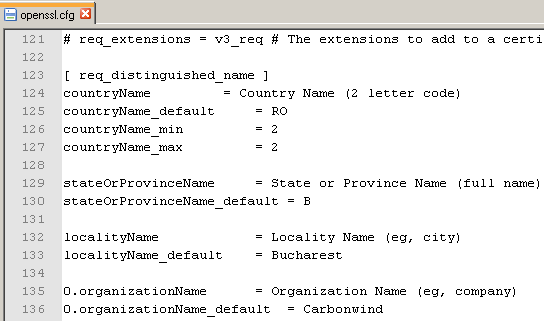 Some quick modifications you may want to do: change the default values for Country Name, State or Province Name, Locality Name or Organization Name. So you won't be needed to enter every time you create a CSR these values. Right now, the openssl.cfg file included in the zip archive contains my default values, see Figure2. First we will create a 2048-bit RSA private key for our CA, see Figure3. Enter a good password to protect the CA's private key, a security measure(the private key will be encrypted using 3DES). You will need to enter this password each time you want to sign a client's certificate or to sign the CRL. 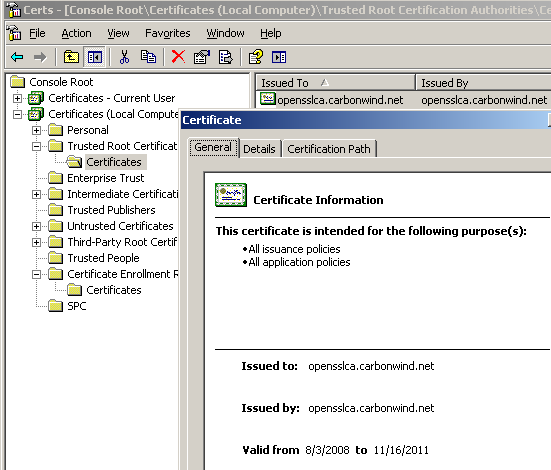 Next we will create the self-signed cerificate of our CA, the root certificate, see Figure4. You will be prompted to enter the password of the CA's private key. Modify as desired the valability period of the CA's certificate. Use a suggestive CN(common name) for your CA. I will use a 750 days valability period for ISA's certificate. Now we need to create the certificate signing request for ISA that we will send to our CA for signing. The first thing to do, is to edit the openssl.cfg file because we need to to issue a certificate that will contain a SAN entry DNS Name, in my case isa.carbonwind.net. If ISA's certificate does not contain this entry, the Mac VPN client will not accept ISA's certificate. Also the Mac VPN client will us this FQDN as the address of the VPN server, so make sure that this is a name that the Macs can resolve, either using a public DNS server or their local /etc/hosts file. I've already added the needed line to the openssl.cfg file, you just uncomment it(remove the #) and enter the desired DNS Name, see Figure5. Then save the changes made. Next will generate ISA's RSA private key(the default 2048-bit value will be used) and the CSR, see Figure6. Enter a good password to protect the private key(3DES will be used to encrypt the private key). I've used the CN (common name) isa.carbonwind.net, the same FQDN entered in the SAN field. And now we will sign ISA's certificate, see Figure7. You will be prompted to enter the password for the CA's private key. And after these steps we have a certificate along with its correponding private key for ISA. Now edit the openssl.cfg file and comment (add the #) the subjectAltName line, see Figure8. We do not need a SAN entry for the Mac OS X VPN clients. If you forget to do this change, you will continue to issue certificates which contain the SAN field. So by now we have a certificate for the VPN server. Let's issue a couple of certificates for the Mac VPN clients. I will use a 750 days valability period for the Macs' certificates. First for a client named macx. Generate macx's RSA private key(the default 2048-bit value will be used) and the CSR, see Figure9. 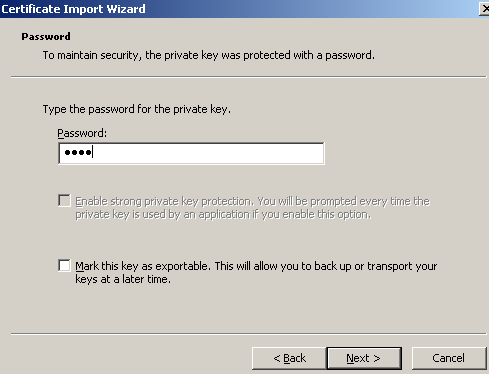 Enter a good password to protect the private key(3DES will be used to encrypt the private key). I've used the CN (common name) macx.carbonwind.net. 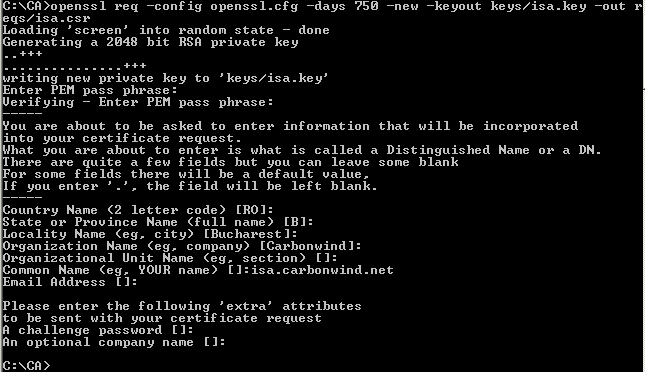 Because of the configured default values in the openssl.cfg, this is an easy and quick process. 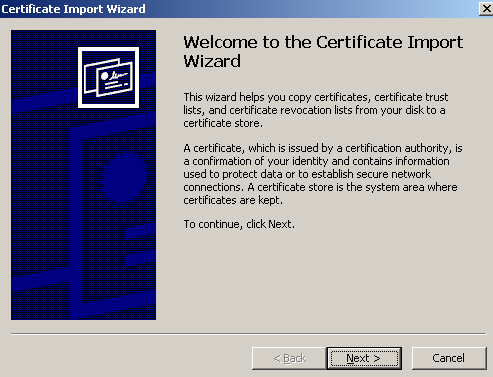 Sign macx's certificate, see Figure10. You will be prompted to enter the password for the CA's private key. Repeat the above steps for the second Mac VPN client called macy. Generate macy's RSA private key(the default 2048-bit value will be used) and the CSR, see Figure11. Enter a password to protect the private key. 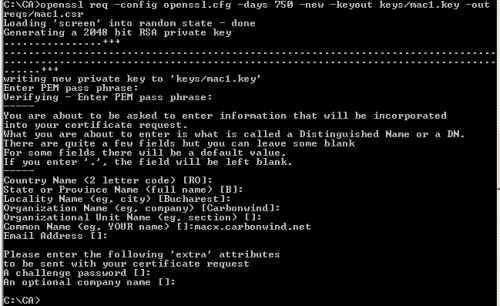 I've used the CN (common name) macy.carbonwind.net. And now we will sign macy's certificate, see Figure12. You will be prompted to enter the password for the CA's private key. 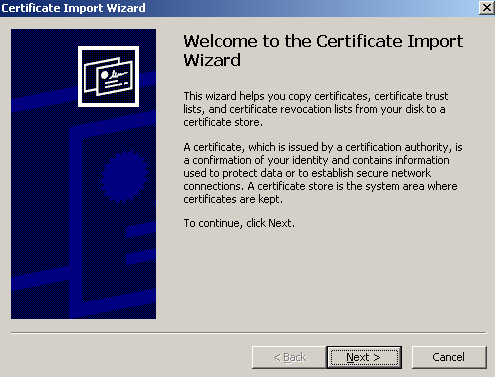 But for example, we cannot import on ISA the certificate we've generated just the way it is right now. So we're going to group into a PKCS #12 file ISA's certificate, ISA's private key and the CA certificate, see Figure13. You will be prompted to enter the password for ISA's private key. Also, since we've included ISA's private key into the PKCS #12 file, enter a password to protect this private key(the export password). We're going to repeat the above steps for macx's certificate, to group into a PKCS #12 file macx's certificate, macx's private key and the CA certificate, see Figure14. You will be prompted to enter the password for macx's private key. Again, since we've included macx's private key into the PKCS #12 file, enter a password to protect this private key(the export password). And one more time, for macy, group into a PKCS #12 file macy's certificate, macy's private key and the CA certificate, see Figure15. You will be prompted to enter the password for macy's private key. Since we've included macy's private key into the PKCS #12 file, enter a password to protect this private key(the export password). We also need to import on ISA the CA's certificate. We've already included the CA certificate into ISA's PKCS #12 file, however it will be faster to just import the separate CA certificate, so I will convert the CA certificate from PEM(base64 encoding of the DER encoding) to DER, see Figure16. And in the export folder we have the files that need to be imported on ISA and on the Mac VPN clients, see Figure17. I've copied on ISA the ca.cer and isa.p12 files. 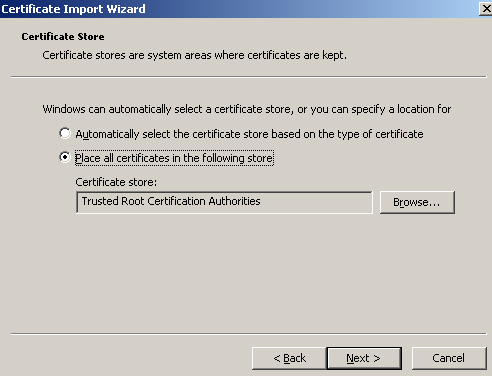 First I will import the CA certificate into the Trusted Root Certification Authorities, Certificates (Local Computer) store, see Figure18. 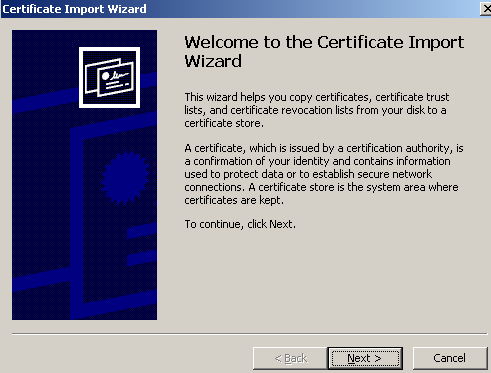 Click Next on the Welcome to the Certificate Import Wizard, see Figure19. Select the CA certificate to be imported, see Figure20. 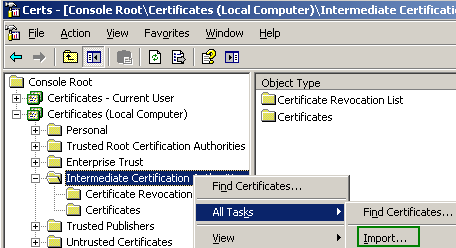 Choose Place all certificates in the following stored, the Trusted Root Certification Authorities store being by default selected, see Figure21. And click Finish, see Figure22. A quick look at the imported CA certificate, see Figure23. 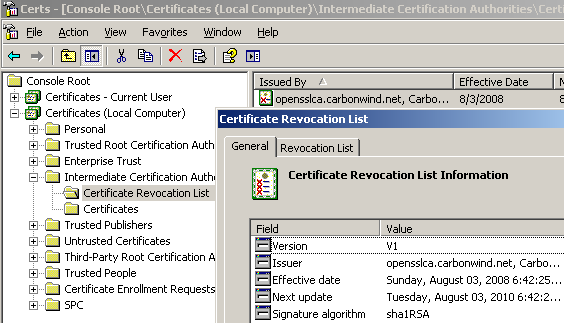 And now let's import ISA's certificate into the Personal, Certificates (Local Computer) store, see Figure24. 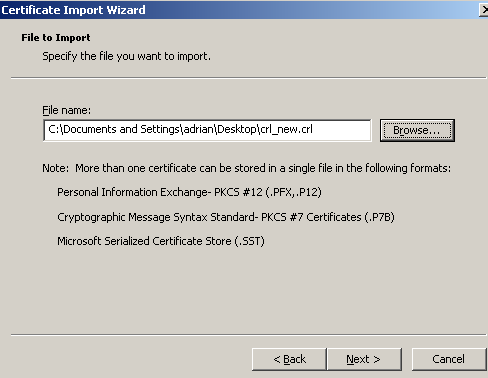 Click Next on the Welcome to the Certificate Import Wizard, see Figure25. Select ISA's certificate to be imported, see Figure26. Enter the password protecting the private key (the export password you've entered with OpenSSL), see Figure27. 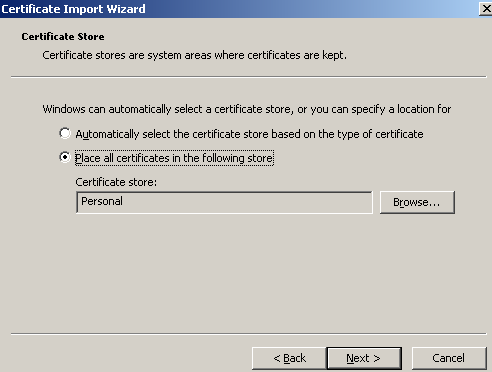 Choose Place all certificates in the following stored, the Personal store being by default selected, see Figure28. And click Finish, see Figure29. A quick look at the certificates imported on ISA, see Figure30. 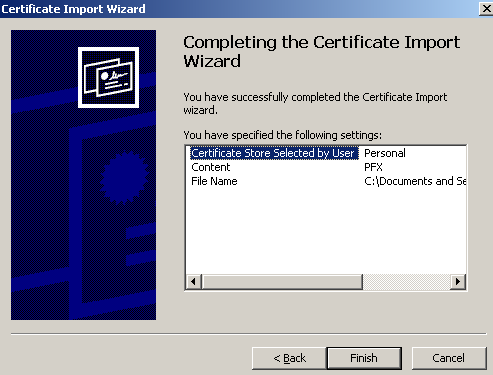 As can be noted the CA certificate was also placed into the Personal, Certificates (Local Computer) store. We can delete it, we don't need it here. If we analyze ISA's certificate, we can view that it has a corresponding private key, see Figure31. Also the required SAN field is present, see Figure32. We're not done yet with ISA's configuration. 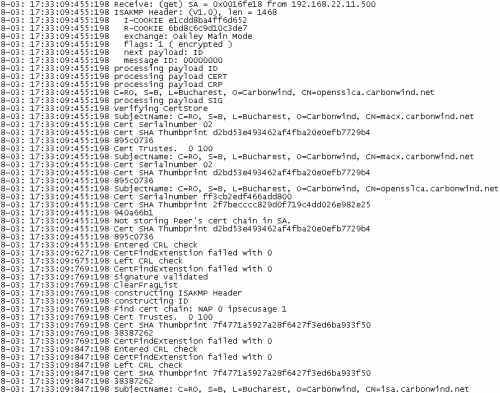 If an L2TP/IPsec client will connect at this moment, using one of the two certificates we've issued for the VPN clients, the connection will fail. 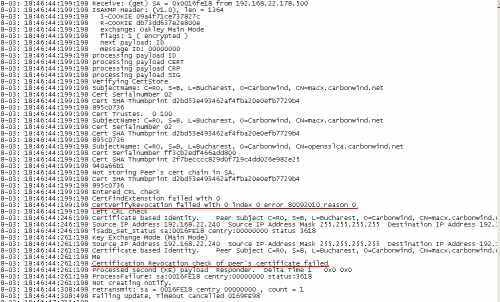 If we look at the Oakley.log on ISA, we'll notice that the error "failed to get chain -2146885628" appears, see Figure33. 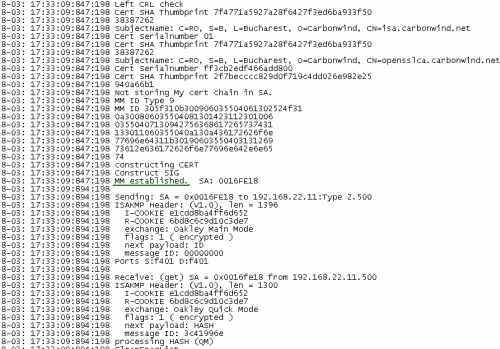 Figure33: Oakley.log on ISA - Error "failed to get chain -2146885628"
A quick solution to this is to reboot ISA. It did the trick for me, see Figure34 and Figure35. I've tested on two different ISA Server 2006 SE installed on Windows Server 2003 Standard R2 SP2. Same story. The reboot fixed this problem. Actually I recommend you to do a first test using a Windows L2TP/IPsec VPN client. For example, I've used a Windows XP SP3 machine. Once I saw that ISA is configured correctly, I've made a test with a Mac OS X L2TP/IPsec VPN client. There is one more thing we can do on ISA before moving and configure the Mac L2TP/IPsec VPN client: install a CRL (Certificates Revocation List). We did not revoke any certificates yet, but it would be be useful to give ISA a CRL it can check. You can skip this part if you want. 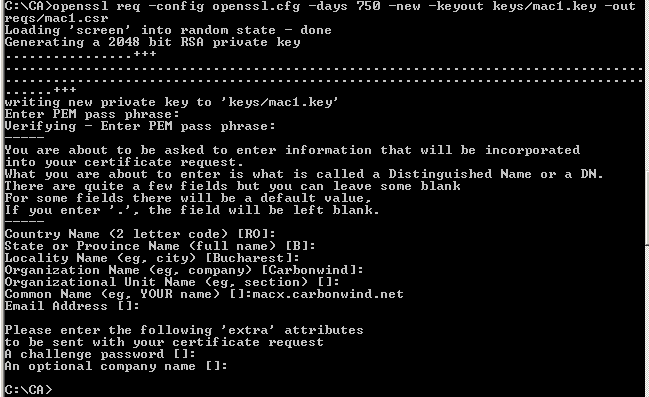 I've set the expiration period of the CRL to 730 days in the openssl.cfg file. Just to make sure there won't be any complaints because the CRL has expired. You can modify this value if you want, see Figure36. Generate the CRL, see Figure37. Copy the crl.crl file located in the crl folder, see Figure38, on ISA. The CRL goes into the Intermediate Certification Authorities store, Certificates (Local Computer) on ISA, see Figure39. Click Next on the Welcome to the Certificate Import Wizard, see Figure40. Select the CRL file, see Figure41. 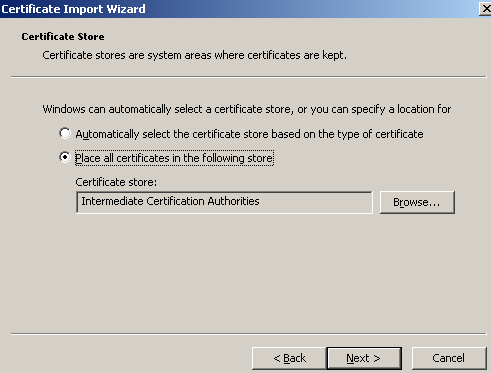 Leave the default option in place, Place all certificates in the following store, Intermediate Certification Authorities, see Figure42. And click Finish, see Figure43. Let's take a look at the CRL imported on ISA, see Figure44. And we're done for now with ISA. Time to import on a Mac OS X machine one of the certificates we've created for the Mac OS X L2TP/IPsec VPN clients. 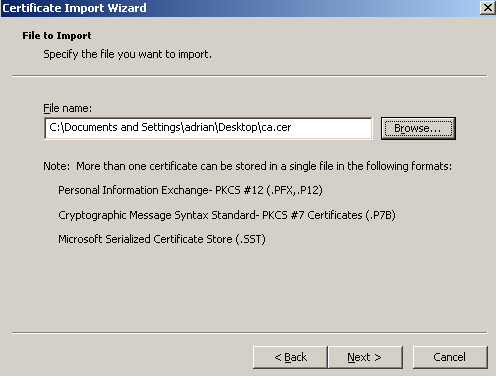 I will import macx's certificate. 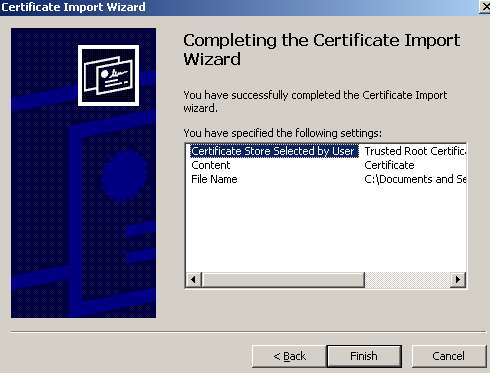 We've already covered the process of importing a certificate on the Mac in the first part of this article. So there is no point in discussing it in detail one more time. I've simply dragged the .p12 file into the Keychain Access, System window. You will be prompted for the password of the .p12 file(the export password you've entered with OpenSSL), see Figure45. 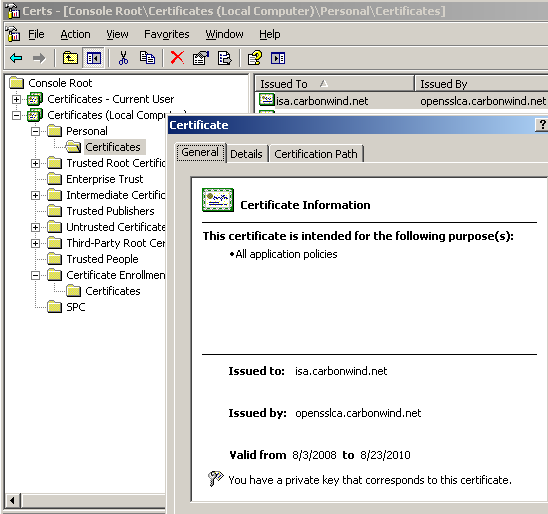 And the client's certificate along with its corresponding private key and the CA certificate were imported into the System Keychain, see Figure46. The client's certificate along with its corresponding private key are in the correct keychain. 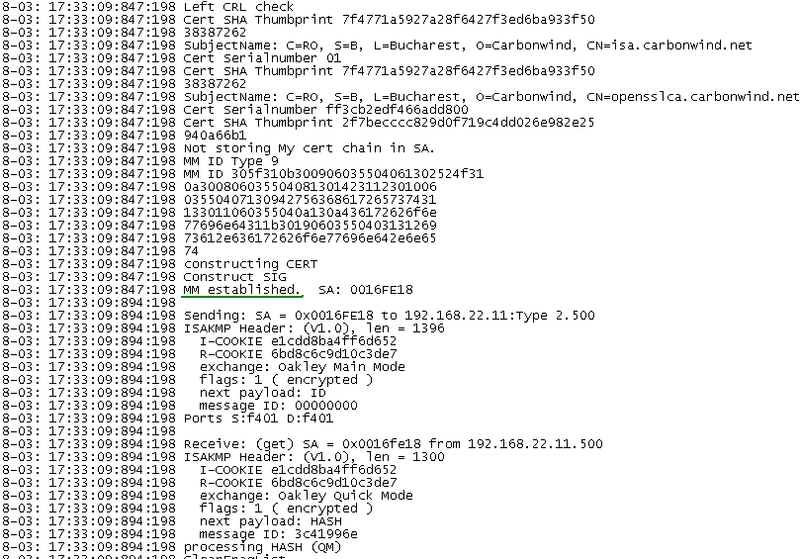 However the CA certificate must be in the X509Anchors keychain. 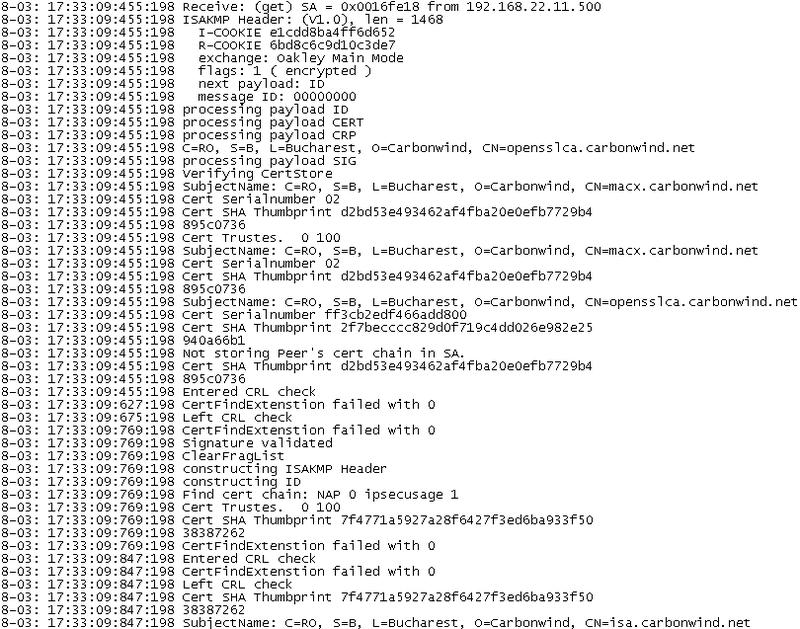 Simply drag the CA certificate into the X509Anchors keychain, see Figure47. As can be noted from Figure46 and Figure47, the certificates imported on the Mac are not yet valid. Close and re-open the Keychain Access utility. If needed, reboot the Mac machine. 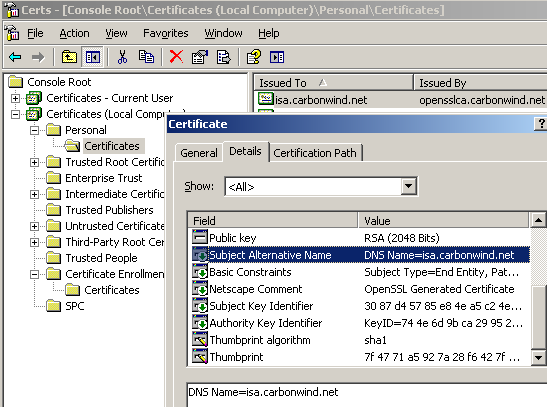 The client and CA certificates should appear now as valid, see Figure48 and Figure49. 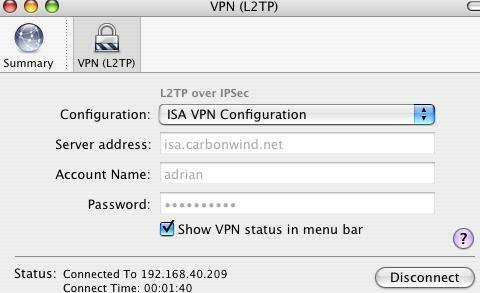 I've configured the L2TP/IPsec connection on the Mac VPN client, see Figure50. Note that the server address matches the FQDN from ISA's certificate SAN field. I've selected the machine authentication certificate. Since we are using a FQDN as the VPN server address, we need to make sure that the Mac can resolve this name, so I've added the required entry in its etc/hosts file, see Figure51. I've clicked the Connect button of the L2TP/IPsec VPN connection on the Mac, and I'm connected, see Figure52. You may want to revoke a client's certificate. For example I will revoke the macx's certificate, see Figure53. And create a new CRL to import on ISA, in order to inform ISA that the macx's certificate was revoked, thus is no longer valid, see Figure54. Delete the old CRL from the Certificates (Local Computer), Intermediate Root Certification Authorities store and import the new one, see Figure55 and Figure56. If I will connect now from the Mac client with the macx certificate installed. 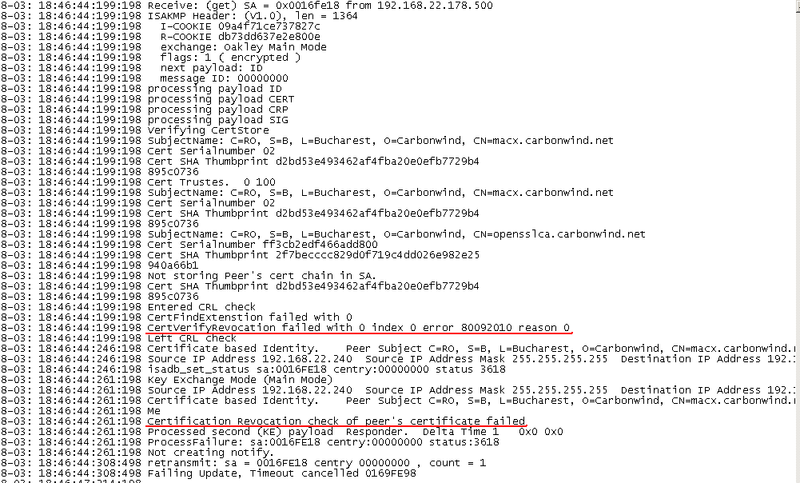 IKE authentication will fail on ISA, the certificate presented by the VPN client did not pass the CRL checks. The Oakley.log on ISA shows this, see Figure57.